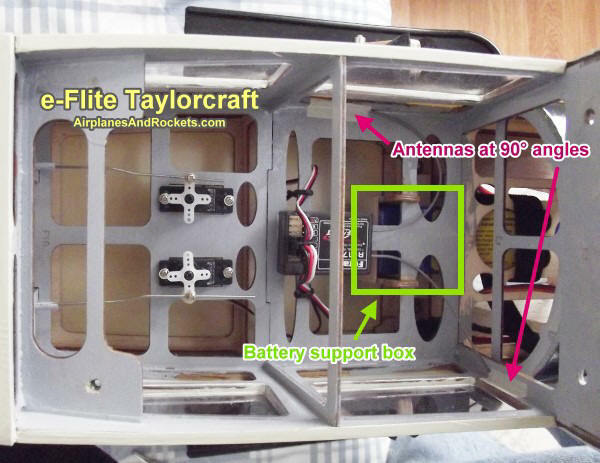 Now I know why nearly everyone who has submitted a comment or review of E-flite's electric-powered Taylorcraft 450 has raved about its quality of construction and flight characteristics. Since it was first introduced three or four years ago, I have placed in it Horizon Hobby's online shopping cart, and then removed it, a couple dozen times. I never went through with the order until recently for two reasons: There just wasn't enough free time to fly it, and my innate resistance to buying pre-built airplanes rather than building them myself. Well, there's still not much free time either for flying or building, so at least by giving in and buying an ARF model, that will offset some of the time that would be needed to build one. 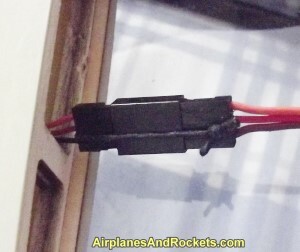 In fact, I do have yet another electric-powered Carl Goldberg 1/2A Skylane in the works - about ready for covering - but with my schedule, it's still a long way from being ready for its maiden flight. But, I digress. The Taylorcraft is absolutely every bit as good as people say it is. Here is short video of my Taylorcraft flying off the snow using DuBro skis, and an in-flight video taken from the Taylorcraft with a small Kodak video camera rubber-banded to the fuselage. (lower on this page). The quality of engineering is utterly impressive. Laser-cut balsa and plywood components throughout all of the structure (no foam, I don't like foam) has had all unnecessary mass removed. What few parts remained to be assembled fit very well. Although everything could have been used as provided, I took a little extra trouble to re-adjust the wing bolt holes to achieve perfect alignment with the fuselage and tail surfaces. Thick CA glue was used to reinforce all of the high stress joints like the engine mount box and the landing gear mount components. Factory-made glue joint looked good, but ARFs have a well-known propensity for weak glue joints in those areas, so I figured better safe than sorry. CA is cheap. All control surfaces come pre-hinged, but the massive amount of excessive glue that seeped between the fixed surface and the moveable surface caused a high level of stiffness that would put undue strain on the servos. 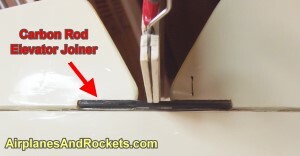 Ailerons, elevator halves, and rudder all suffered from the problem. Again, hundreds or thousands of people have flown with the hinge lines like that, but I chose not to. 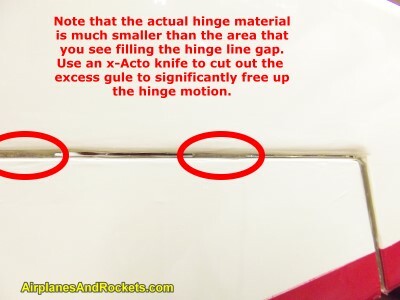 When you inspect the joints between the surfaces, at least on mine, you see a large amount of yellowish glue that occupies about half of the total length of the joint line. A little careful cutting and scraping with an x-Acto knife revealed that the actual hinge area is only about 1/2" to 3/4" long. Everything else was useless glue. 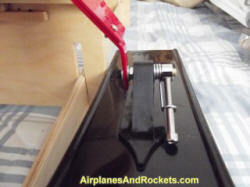 After removing all that excess glue, there was a huge difference in how easily the control surfaces moved. If you do nothing else optional on your Taylorcraft, do this. Your servos will thank you for it by lasting a lot longer. Click the image to the right for a larger version. Another thing I did was beef up the connection between the two elevator halves. A rather thin music wire joiner come installed which caused the half without the control horn to move less than the half with the control horn. I epoxied a short length of 3/6" carbon rod between the two halves on the bottom, below the existing wire joiner. It completely eliminated the differential movement and adds very little weight. On second though I would rank this change above clearing glue from the hinge lines. Differential elevator throw can introduce unexpected roll to the airplane, particularly at high speeds with lots of airflow over the elevators. Also, after the landing gear mounting plate started showing signs of weakness, I replaced the original wood with sturdy 5-layer aircraft plywood. Fortunately, I had some red Monokote on-hand to use over the new wood. It will outlast the life of the model. One other major change was made, but this one really is not critical as long as the strap for the batter pack is tightened securely. I did not care for the way the battery pack could potentially slide from front to back, and how the back part of the pack was pressed against a bulkhead once strapped down. I am using the recommended battery packs, so it is nothing the model wasn't designed to accommodate. 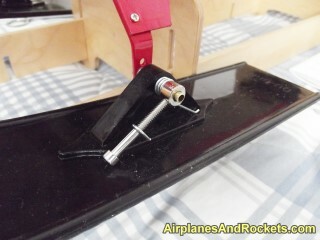 I used a little bit of 1/6" aircraft plywood to build a cradle that captures the rear portion of the battery pack to support the battery off of the bulkhead and to prevent lateral motion. 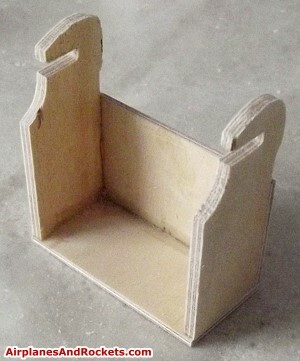 The photo below shows what the cradle looks like when installed. Click on the photo for a larger version. A close-up of the cradle hanging on the cabin floor frame is also provided. Now, the Velcro strap only needs to snugged down in order to reliably hold the battery pack in place without stressing it across the bulkhead. More importantly is that the model's center of gravity will not shift if the battery shifts position. One final thing is a note about making certain that the servo extensions buried inside the wings are securely tied together. I use heavy waxed cord that is used for sewing leather. It's a lot like the waxed lacing cord used for electronic cable bundling. A photo is shown here for reference. Two big items factored into my decision to finally break down and buy the Taylorcraft, and that was to finally do something I have always wanted to do but never took the trouble to implement. The first was to strap a video recorder onto the model to get some in-flight motion pictures of my own, like so many seen online. The second goal was to install a set of skis for flying off the snow. A set of DuBro snow skis was ordered from Tower Hobbies, along with a Futaba 6EX digital radio Futaba S3117 high-torque, high-speed micro servos. 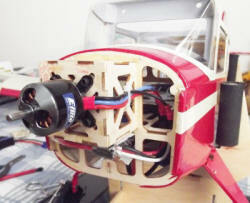 E-flite's Park 450 brushless motor provided power, along with an 11.1V, 3,100 mAh LiPo battery pack (2 ea.) were procured from Horizon Hobby. The wheel axles are a set of 4-40 x 1" bolts (aka machine screws), which fit the holes in the provided lightweight wheels. The holes in the DuBro snow skis were drilled for a 5/32" axel. The fit was way too sloppy for the skis, so I cut a piece of 1/8" I.D. brass tubing, which conveniently has a 5/32" O.D., over the threads of the 4-40 bolt. The holes in the wheels were drilled to 5/32" so that the brass tubing would not have to be removed for the wheels. Besides, I never liked the thought of plastic wheels rotating over 40 little sharp thread edges per inch. The supplied wheels have been replaced with larger wheels because whether on grass or asphalt, the originals were too small for good ground handling. 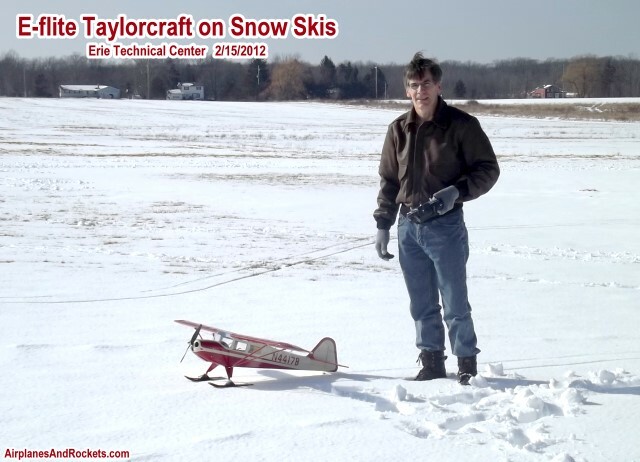 Here is a short video of my Taylorcraft flying off the snow. It is really nice and smooth compared to grass or pavement. Unfortunately, the 2011-2012 winter season has been one of the least snowiest in history. The last two winters had record high snowfalls in February, but boy, let me finally buy snow skis and what happens? No (well almost none) snow! That's unheard of in Erie, Pennsylvania! We're usually buried under a couple feet of snow by now, with no bare sidewalks in sight since early December. OK, so my next big goal was recording an in-flight video from the Taylorcraft. I bought a relatively cheap, lightweight Kodak digital camera that takes videos as well as still pictures. I spent enough (about $80) to get one with at least some level of image stabilization. The results of my first attempt can be seen below. I edited out the boring stuff and let only the action-packed footage. The flight occurred at a small business park in Fairfield, PA. The next time I take 'er up, I plan to climb high enough to get a good shot of Lake Erie, which is about 2 miles away. 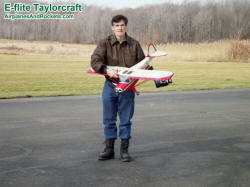 I'll also try some rolls, spins, and inverted flight flight with the camera mounted. I'm hoping to avoid the recording of a crash. Here in Erie, we get a lot of strong winds from the lake, so flying opportunities for a model with as light a wing loading as the e-Flite Taylorcraft are fairly rare. I won't fly it yet with more than about a 10 mph wind at ground level.